There are strings. And there are theories. That’s all I know. That’s all I want to know. Now fix me a tuna cacciatore, and make it quick. 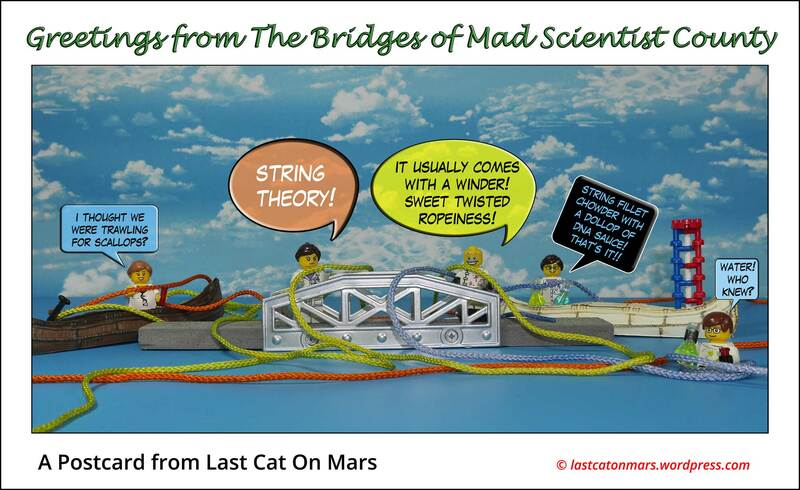 This entry was posted in Science, Snapshots and tagged bridge, canoe, cartoon, comic, dna, dna model, lego, minifigures, scientists, string theory, strings, water on January 24, 2018 by Jay Verney. 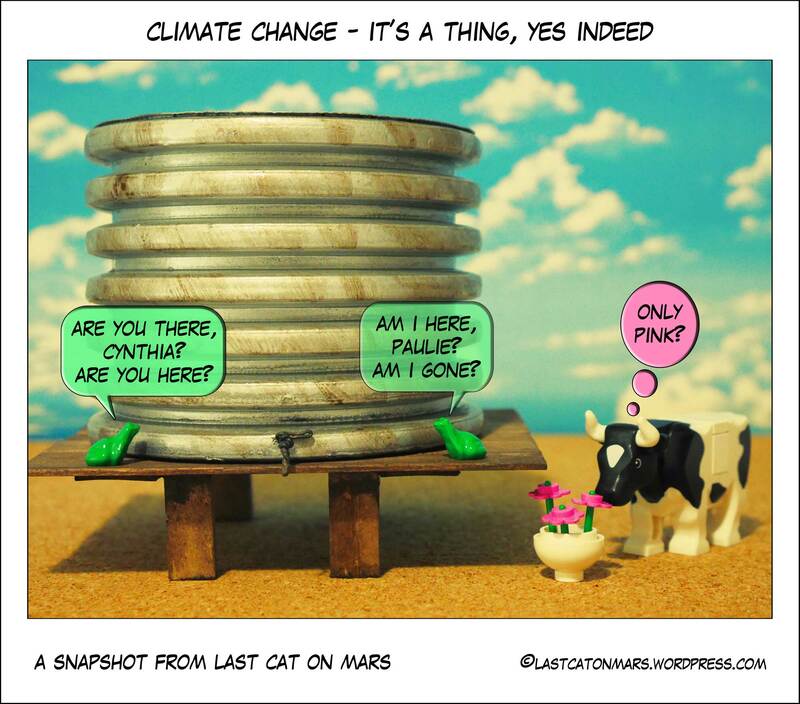 Last Cat On Mars Presents: Climate Change, it’s a thing. Yes, indeed. When I was but a wee kitten, my parents and overly competitive sibling and I would travel into the hill country to visit Mama’s sister, Beck From Jupiter, and her husband, Lomas (we never worked out where he was from, lovely head of fur, though). There I would play in the yard with my overly competitive sibling while the adults got on with their plans to rule the cosmos. He was older than me, OCS was, and could be relied upon to initiate ridiculous games and quizzes, such as, ‘How full is that water tank?’ Anxious to please, and win, I would spend most of the day tap-tap-tapping at the water tank with my tiny, ineffectual little knuckles (yes, of course, cats have knuckles, they’re just well hidden) and asking, ‘Is that it? Is that it?’ of my OCS who, of course, always replied, ‘No, it is not, young Last. Keep tapping,’ as he sashayed around the fenceline in search of, shall we say, playful lizards. It was a source of persistent curiosity to my mother that, at the end of these idyllic sessions on the hill, I would be completely incapable of holding the tidbits of river trout Mama handed over to my OCS and me in the back seat. My bruised knuckles would refuse to co-operate, and eventually, after much meowing and consideration, she would haul me into the front seat and onto her lap where she’d paw-feed me the teeny morsels. Needless to say, my OCS in the back seat all alone was rather livid with this outcome, but was I devoid of a master plan just because I was younger, tinier, adorable-er, bruised-er? No, gentle reader, no, I was not. This entry was posted in Snapshots, Variety Show and tagged cartoon, comic, cow, flowers, frogs, lego, water tank on January 10, 2018 by Jay Verney.